Anyways, like most all of the Vuina wines, this is a very enjoyable bottle. Generally smooth with succulent chocolate tones and a slight back end of walnuts and other nut elements, it’s pleasant drinking, albeit with a stronger body than their other wines due to the time spent in the oak boosting it to 14% abv. For 11€, it’s well-priced as well for the region. It’s not however like the Plavac Mali you find in Pelješac and definitely not like those in Dingač, but not everyone can be like those, so, there you go. But, it should be noted that their Crljenak is one of the best currently being produced in Croatia. 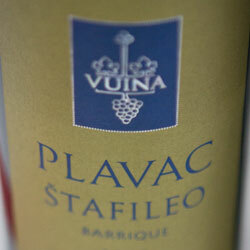 Read more about Vuina’s other wines in our Dalmatia guide.